Uglyworld #328 - "Drop The Knife Now!" (38-365), originally uploaded by www.bazpics.com. Wage wanted to make himself something to eat this morning and Ox suggested that they eat some of the pineapple that Mireille bought for them yesterday at the local supermarket. Wage hasn't had pineapple in quite some time so he decided that Ox's idea was perfect. 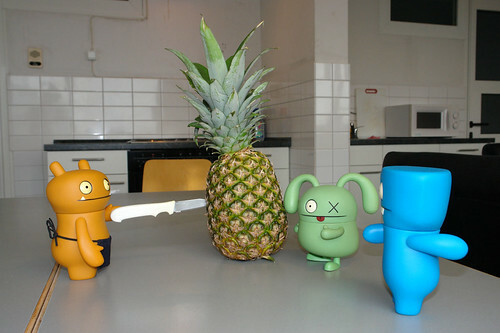 Wage and Ox brought the pineapple over to the kitchen table and Ox carefully handed a knife to Wage for cutting open the pineapple (if you're wondering why Ox was careful you should check out their adventures from last week). One of the smaller Uglies must have picked up things wrongly and tipped off Wedgehead that Wage had a knife in his hand, at which point he dropped what he was doing and ran into the kitchen in the direction of Wage screaming "Drop the knife now!!!". Wage and Ox just turned and looked at Wedgehead who was sprinting towards them screaming at the top of his lungs. As Wedgehead got closer he realised what was going on, slowed down to walking pace and changed his scream to "mmmmm, pineapple, cut me a slice too! ".